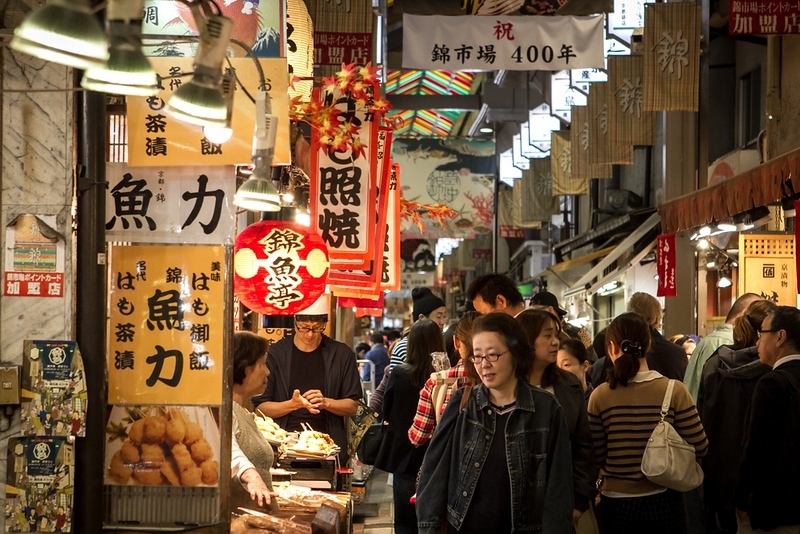 Downtown Kyoto is loaded with hotels, shops, restaurants, bars and clubs. It’s not a main sightseeing destination, but there are some good sights scattered about. 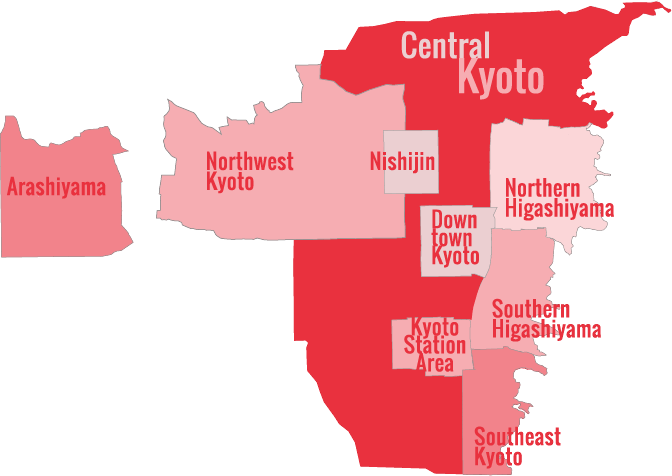 Downtown Kyoto is a roughly square area bounded on the east by the Kamo-gawa River, on the west by Karasuma-dori, on the north by Oike-dori, and on the south by Shijo-dori. Because of its small size, it lends itself to exploration on foot. And, with lots of covered arcades, this is one of the best places to spend a rainy day in the city. The Kyoto International Manga Museum is the best manga museum in the entire country. If you’re a fan of Japanese comics, don’t miss it! This ramen shop may be nameless, but it’s made a name for itself in Kyoto. If you’re into non-touristy dining, you’re in luck. Ultra-local Akagakiya near Sanjo serves up a slice of old-school Kyoto atmosphere along with its tasty izakaya classics. Mumokuteki Café is one of the best vegetarian and vegan restaurants in Kyoto. The food is great and it’s right in the middle of downtown. For excellent soba and udon in superb traditional Kyoto surroundings, check out this longstanding Kyoto classic. If you think you know tofu, think again! The artisans at this branch of a famed Kyoto tofu restaurant chain do more with tofu than you’d have thought possible. There’s a reason Toriyasu has been in business for over 50 years: their oyako-don (chicken and egg rice bowl) is quick, affordable and consistently delicious. This sleek, chic ramen restaurant tucked away in Kyoto’s backstreets serves a phenomenal chicken yuzu ramen. The best time to hit up river ramen? On a cold, rainy weeknight, when everyone else stays home. For a fun, inexpensive night out with friends, try a standing izakaya like Suiba in Shijo Kawaramachi. Good, cheap food and drink – what more could you ask for from dinner? For a quick cup of excellent coffee downtown, head to this ultra-stylish coffee shop on the ground floor of Fujii Daimaru department store. On the west side of downtown, on Sanjo-dori, this wonderful Korean-themed teahouse is a fantastic place for a light meal or a delicious cup of tea. The Kyoto Ninja Restaurant is a ninja-themed restaurant where you’ll take a tour through an underground labyrinth and be entertained by “ninjas” while you eat. It’s great for the kids. A great shop for travel goods, interior goods, clothes and gifts, Muji is definitely worth checking one when you’re downtown. If you’re interested in sewing or other needlecrafts, then you must pay a visit to the fantastic Nomura Tailor shop when in Kyoto. Fujii-Daimaru is a small department store in downtown Kyoto with a strong focus on youth fashion. The basement food floor (known as Tavelt) is quite good here. Located in the basement of Fujii-Daimaru Department Store, Tavelt is a small but excellent food floor. The takeaway sushi and sashimi is especially strong. Pagong sells shirts, blouses and dresses made of traditional yuzen-dyed kimono fabrics. They make truly distinctive souvenirs and gifts. A true international luxury hotel on the banks of the Kamo-gawa River in the heart of the city, the Ritz-Carlton is easily one of the best hotels in Kyoto. Aoi Kyoto Stay is a collection of beautifully restored Kyoto machiya (traditional townhouses) that have been converted into accommodations. While they retain their classic Kyoto interiors, Western comforts like beds, showers and floor heating have been added. These houses offer you the rare chance to experience traditional Japanese living without sacrificing your comfort. They are perfect for couples and families. Highly recommended! Opened in 2016, the Solaria Nishitetsu commands one of the very best locations in all of Kyoto. It’s a stylish hotel with very reasonable rates given the location and quality. With a fantastic location right in the heart of downtown Kyoto, the Royal Park is an efficient and reasonably priced business hotel perfect for a short stay in Kyoto. (View on Booking.com or Agoda.com). If you’re looking for a stylish hotel right in the heart of the Gion entertainment district, at a reasonable price, you should take a close look at the Kyoto Granbell Hotel. The Grand Bach Kyoto is a very reasonably priced business hotel with a little style and a great location right smack in the middle of downtown. Right in the heart of the downtown Kyoto shopping district, the Gracery is a well-run moderate hotel with small but comfortable rooms and everything you need for a short stay. Right on Sanjo-dori in the heart of Kyoto’s Downtown dining and entertainment area, the Kyoto Royal Hotel and Spa is a great place to stay for those who want convenience and plenty of dining options. The Karasuma Kyoto Hotel is a conveniently-located business hotel just south of Kyoto’s main downtown shopping district. It’s starting to show it’s age, but the prices and convenient location make it a decent choice. Note that single rooms are very cheap here. If you’re looking for a central Kyoto location, spacious rooms and really competitive prices, the Hearton Hotel Kyoto is a great choice. The Hotel Gimmond is a decent business hotel on Oike-dori, a short walk from the Karasuma-Oike subway station. It’s a bit dated, but the price is right. From Kyoto Station: Take the Karasuma Subway Line to Shijo Station (preferred) or Karasuma-Oike Station. On foot from Kyoto Station: Walk straight north on Karasuma-dori or along the Kamo-gawa River for about 20 minutes. By Hankyu Line (from Osaka etc): Get off at Karasuma or Kawaramachi stations. By Keihan Line (from Osaka etc): Get off at Gion Shijo or Sanjo Keihan Stations.